Cambodia could become a future Asean technology hub and ‘smart nation’ if plans by Prime Minister Hun Sen come to fruition. Speaking at the opening of the new Ministry of Post & Telecommunication (MPTC) head office in Phnom Penh, Mr Hun called on all Cambodians, particularly government officials, to become familiar with information technology. 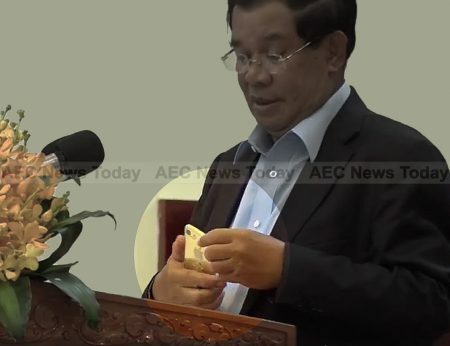 Waving a gold iPhone at his audience, Mr Hun highlighted the usefulness of a smartphone for his daily tasks, warning that civil servants who could not use a smartphone would now no longer be promoted. “Even though [the level of] technology is high, people do not know how to use it, it’s no different, so if they do not know how to use technology, do not promote [them] because they will make others busy”, he said. The ‘Smart Nation’ concept was introduced in Singapore in 2014 with the aim of creating an open data system enabling people access to data free of copyright restrictions. The programme requires citizens and companies to innovate and collaborate with the government. Initiated by Prime Minister Lee Hsien Loong with cooperation by the Singapore Ministries of education, communications and information, state, and foreign affairs, the programme has enjoyed considerable success, particularly with the provision of eGovernment services, and public transportation services in particular. Calling for Cambodia to become a ‘smart nation’, Prime Minister Hun said the government needs to transform itself into a technology based society and address the crucial need of information technology literacy. Praising the level of technology development in the country, Mr Hun pointed out that even bullock-cart drivers now have cell phone’s, showing how the country is closing the technology gap. To further narrow the technology gap, Mr Hun called on Royal Group, one of Cambodia’s largest corporations, to dust-off plans it announced in April 2011 to put a Cambodia communications satellite into orbit. “It is time you partner with another company to launch a satellite for the benefit of our country”, Mr Hun directed at Royal Group ceo Kith Meng. “Once the satellite is operational, telecom companies will rent the service and all [Cambodian] television broadcasters that use satellites will switch to using ours”, the Prime Minister said. Originally speculated to cost between $250 million to $400 million and slated to go into orbit in 2013, little has been heard of the communications satellite plan since. Cambodia’s ambitions to become a ‘smart nation’ by adopting modern technology systems is well under way. Earlier this month, Anhui Easy Business Digital Technology Co., Ltd, an eGovernment and eCommerce provider in China, met with Cambodia Minister of Commerce Pan Posak to present its plan for investing in eGovernment systems in the Kingdom. An E-Commerce law is on its way to the Council of Ministers for review before becoming law (See: After 8 Years Cambodia E-Commerce Law Nears), while an ‘ICT Master Plan’ developed by the Cambodia Ministry of Commerce (MoC) details better technology infrastructure for automated systems to help civil servants deliver services to the public more effectively, and to attract more foreign investors. According to a seven minute-long video posted on the Ministry of Commerce (MoC) Facebook page, the ‘ICT Master Plan’ focuses on the use of ICT systems for the delivery of improved business services, electronic administrative document control, a trade repository center, and improvements to website and internet systems. “Now that the country has seen the introduction of eGovernment and eCommerce systems, it is time to develop ePeople” Mr Hun said. Bringing it all together will be high-speed internet. Earlier this year We Are Social, a social media marketing agency, published the Digital in APAC 2016 report showing that Cambodia’s mobile connection growth is galloping along at 7 per cent, compared with a regional average of 4 per cent; growth in internet users is 32 per cent, while the number of Facebook users has gone up to about 4 million this year. 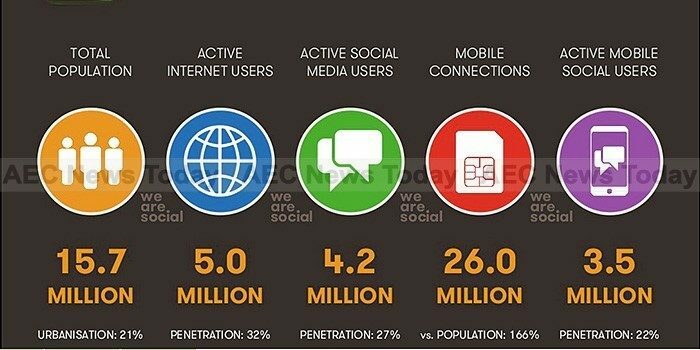 The number of mobile social media users increased 59 per cent year on year. Meanwhile internet use and e-commerce in the Kingdom is expected to receive a boost when the new $70 million, 1,300km (808 mile) MCT internet cable commences operation early next year (See: New Cables to Boost Internet Service In Five Asean Nations).